You can travel from Incheon to Ewha by "limousine" bus, or by rail. Bus tickets can be bought at counters in the passenger reception hall after exiting customs. Money exchange is of course also available in the same area, and there may be better rates than your home bank. The buses leave from the street directly outside the passenger reception area. Bus number 6011 will go to Ewha university. To take rail, follow the KTX signs downstairs and under the street. After a moving walkway, you will arrive in a large hall with shops. Continue past the information desk and down to the end of the hall. There will be ticket counters and machines on the left and right. If your Hotel is near Seodaemun Station (Shilla, Vabien Suites) continue on the airport line until you reach Gongdeuk Station. Transfer to line 5 towards and get off in three stops at Seodaemun Station. If you are staying near city hall you can also take the more comfortable non-stop train from the airport on the right side of the KTX hall. You will arrive in Seoul station and then follow the signs up and to the the subway line 1. Purchase a ticket in a machine and head toward City Hall. It's the first stop. The airport line has a stop at Hongik Univ. Station. 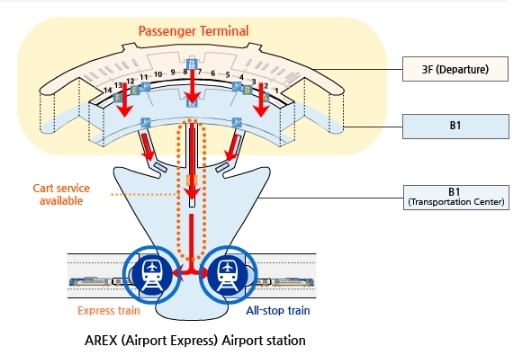 It's important that you take the all stops train from the airport, not the express train. 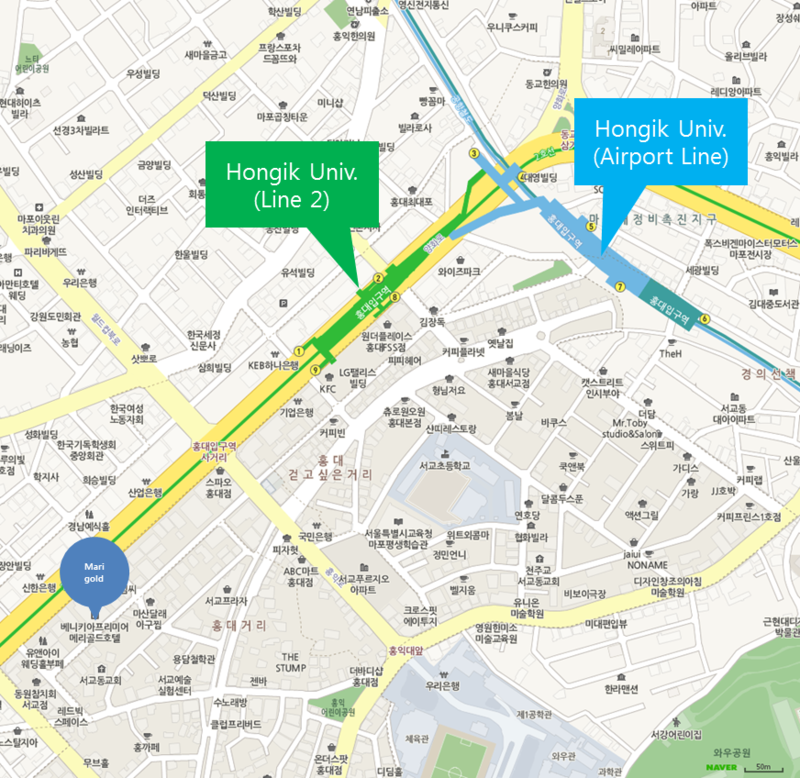 Once you arrive at Hongjik University station you can walk toward line 2 (green below) and/or ultimately toward exit 9. Or take exit 7 directly from the airport line (blue line below) if you prefer to walk street-side more. You can also take a taxi from Incheon Airport to Ewha Womans University, Seodaemun Area and City Hall Area. It takes about 1 hour 10miutes and costs KRW 50,000.